In 1816, just five years after the Commissioners' Plan laid out the streets and avenues above Greenwich Village, Eighth Avenue was extended northward. It ran essentially along the eastern border of the Moore country estate, Chelsea. Within only a few years the avenue would see development. The Drake family purchased the land at the northeast corner of Eighth Avenue and 22nd Street around 1829. By the 1840s they erected a three story house-and-store building that reflected the emerging Greek Revival style. Faced in orange-red brick laid in running bond, its attic level featured squat openings under the dentiled cornice, rather than the peaked roof with dormers found in the Federal style. The store level became a bakery. Its proprietor decided either to retire or simply move on in the spring of 1855. An advertisement in The New York Herald offered "For Sale--A bakery, on one of the best avenues in the city, occupied by the present proprietor nearly seven years...Cheap rent." The Drakes, who would retain ownership of the property for more than a century, were looking for a new tenant again in September 1861. A succinct advertisement in The New York Herald offered simply "To Let...No. 236 Eighth avenue. House and Store." It is unclear who occupied the store space for the next few decades. The proprietor advertised a "stylish bay horse, for road and business purposes" for sale in October 1874; suggesting that he offered delivery services. And whoever lived upstairs in 1883 was doubtlessly crestfallen when his petition "to keep chickens" in the yard was denied by the Health Department. In 1888 Thomas Burnett received his license to operate a newspaper stand outside the store. And the following year Charles E. Abbott opened his new bakery. Born in South Londonderry, Vermont in 1859, he came to New York in 1878, taking a job in the bakery of H. B. Cushman. Six years later he went into the restaurant business. By 1889 he had two successful restaurants, but sold them that year to open his bakery. Unmarried, Abbott lived just a block to the north, at No. 279 West 23rd Street. His bakery initially offered only bread, and then branched into pastries. Before long he advertised "wedding cakes a specialty." Like his predecessor, Abbott provided delivery service to hotels and restaurants. The bakery's horses and delivery wagons were housed in a stable at No. 341 West 21st Street. Business was so successful that in 1893 Abbott invested in a new oven that cost him $377--more than $10,000 today. Abbott employed 13 men who worked about 69 hours a week. Bakeries, unlike grocery stores or hardware shops, for instance, remained opened on Sundays. The staff had the option of working either Saturday or Sunday (those shifts were 10 hours long). In 1898 Abbott hired architect P. F. Brogan to enlarge the building to the rear. The two-story brick extension cost $2,000 (nearly $60,000 in today's dollars). Brogan nearly matched the original brick color, and created a handsome utilitarian structure embellished with brick panels below the egg-and-dart ornamented cornice, and pleasing terra cotta ornaments. The bakery proper took up the ground floor of the new building, and the offices moved into the second story. Abbott's two-story extension houses a ground floor restaurant today. The property was owned by Mary Drake at the time. The wealthy widow now lived in Philadelphia. In 1899 she renewed Abbot's lease for another eight years at what would amount to about $12,000 a year today. In the meantime, Charles Abbott was doing very well for himself. An active Mason, by 1900 he was a member of the exclusive New York Athletic Club. He enjoyed taking his carriage to the Harlem River Speedway--so named because slower vehicles like sulkies, drays and bicycles were prohibited. In 1900 John Hill Walbridge noted "Mr. Abbott is a member of...The Road Drivers' Association, being owner of Alverna, a fast black pacer, which, with his neat bicycle wagon, is a turnout well-known to the Speedway and other fashionable New York drives." The sidewalk newstand was still out front, having been operated by Israel Goldfarb for several years. Each year he applied for his permit, since sidewalk "encumbrances" were strictly monitored by the City. In 1901, for instance, Abbott applied for and received permission to erect a "storm-door in front of his premises." Similar to temporary structures still erected today to protect restaurants and stores from cold air, it would have protruded several feet into the public sidewalk. But labor problems to the west would soon give Abbott and other bakers greater problems to think about. Bakers' ovens required vast quantities of coal daily. In September 1900 coal miners went on strike, returning to work only after their wages were increased. A 1901 report of the Congressional Industrial Commission pointed out "Eighty-five per cent of the cost of producing anthracite coal goes to the wages." Naturally, those increases were passed on to the consumer. On the evening of September 30, 1902 the Retail Bakers' Association met in Abbott's offices to discuss the crisis. Abbott forewarned a reporter from The Evening World "While I do not like to pose as a pessimist, I must confess that at present it looks as if many of the smaller bakers will have to close down unless there is soon a decided change in the coal market. In many cases small bakeries are buying coal daily, just enough to keep going for twenty-four hours, not knowing where or how the next day's supply may be obtained." The newspaper projected that the price of bread might go up one or two cents a loaf. Abbott was president of the Retail Bakers' Association, so when a city-wide strike of bakery workmen was declared in October 1904, a meeting was held in Abbott's 21st Street stables. The union men were requesting salaries of $18 a week for foremen, and $15 for "underhands." The union wanted $3 per day for temporary workers, brought in for day work. The wages requested for the foremen would be equal to about $495 a week today. Not all the bakery owners were pleased. 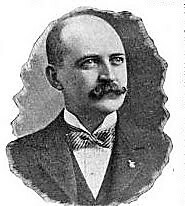 George E. Millspaugh ranted "I think that I should be the judge of what they are worth and pay the accordingly, and not on the basis of any union scale." Although Abbott had paid for the extension in 1898, Mary Drake shared the expenses with him in updating the windows in 1906. The total cost was $675. That same year the lease was extended for another 10 years. The remarkable success of Abbott's business was reflected in his staff. In 1913 he employed 37 bakers and one office worker. Two years later the numbers had risen to 45 bakers and 8 clerical staff. In 1914 Abbot incorporated, the firm becoming Abbott Bakeries, Inc. The following year Mary Drake, who was in Italy at the time, hired architect L. S. Beardsley to renovate the storefront. The elements of the extensive, $2,500 upgrades were almost exclusively for reinforcing--"Lally columns, steel girders, cement mortar pier and blue stone"--suggesting structural problems in the aging building. In 1916 the Chelsea neighborhood was plagued by a con artist. On October 19, 1916 The Sun wrote "salesmen in cigar stores, bartenders and almost every sort of employee who stands behind a counter are looking for a Chinaman, Lee by name. He sells tickets covered with strange hieroglyphs that he says are sure to win in a big Chinese lottery he runs somewhere in Fourteenth street." Lee's scam was cleverly devised. He would walk into shops looking for a "wall rack" that listed the name of employees. He would ask for a particular worker and if told that man was not there, he would reply "That's very bad. He won $50 in the lottery this week and I wanted to give it to him." Having peaked the interest of those in the store, he explained how the lottery worked. Tickets cost $2 each; but for an additional fee Lee secretly guaranteed he could arrange it so the buyer would win. "Then he passes on to another place, never to be seen again," explained the article. "After a few days the victim rushes down to 228 West Fourteenth street, the address on the lottery ticket, and finds it to be a boarding house where Chinese are not admitted." Lee was confident in not being caught. Buying lottery tickets was a misdemeanor, so his victims were unlikely to notify police. He hit the jackpot when he visited Abbott's Bakery. The Sun reported "One of his chief sources of revenue recently was Abbott's bakery, at Twenty-second street and Eighth avenue. The employees there bought $40 worth one evening because he said Jim, a day man, had won ninety dollars." Following Mary Drake's death in 1920 the property was conveyed to Millicent Drake. Charles Abbot transferred the presidency of Abbott Baking Corporation to Sam Greenwald at about the same time. The output of the bakery was staggering at the time. 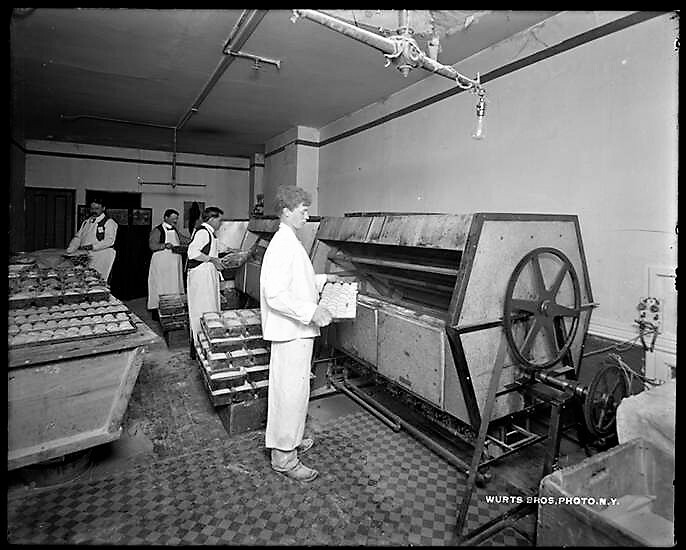 In 1922, according to Baking Industry magazine, it was producing "35,000 loaves daily in addition to rolls and cakes and so on." Charles E. Abbott died on March 18, 1929; but the Abbott Baking Corporation remained in business. On July 8, 1938 Sam Rosenthal went to the Merchants Bank and Trust Company and returned with the week's payroll. Employees were paid in cash until the latter years of the 20th century and keen-eyed thieves were routinely on the lookout for likely targets. Rosenthal turned over the $3,000 in cash to manager Emmanuel Rosenthal. There were, in total, seven employees in the second floor office. Rose Silverman, the bookkeeper, heard a knock on the office door. When she opened it she was confronted with a pistol and told to "keep quiet." Three men pushed into the office. Described by The New York Times as "young thugs, all armed," they forced the employees to lie on the floor, then bound them with wire. An unwitting messenger boy who walked into the office was bound, too. The newspaper reported "The money had been placed in pay envelopes ready for distribution. The thugs scooped it up and ran down the stairs." The Depression Era heist would amount to more than $50,000 today. After her family had owned the property for more than a century, Millicent Drake sold No. 236 Eighth Avenue in 1952. By now the Abbott Bakery had given up the retail store, while still operating the bakery portion in the 22nd Street extension. But within a decade the business that had filled the corner of Eighth Avenue and 22nd Street with the tantalizing aroma of baking bread for generations was gone. In 1964 the building was renovated to accommodate a restaurant on the first floor, two apartments each on the second and third floor, and one apartment on the fourth. Today a restaurant extends from the store front into the extension. Few passersby, other than veteran Chelsea residents, realize that for about three quarters of a century the Abbott Bakery was a fixture on the corner.